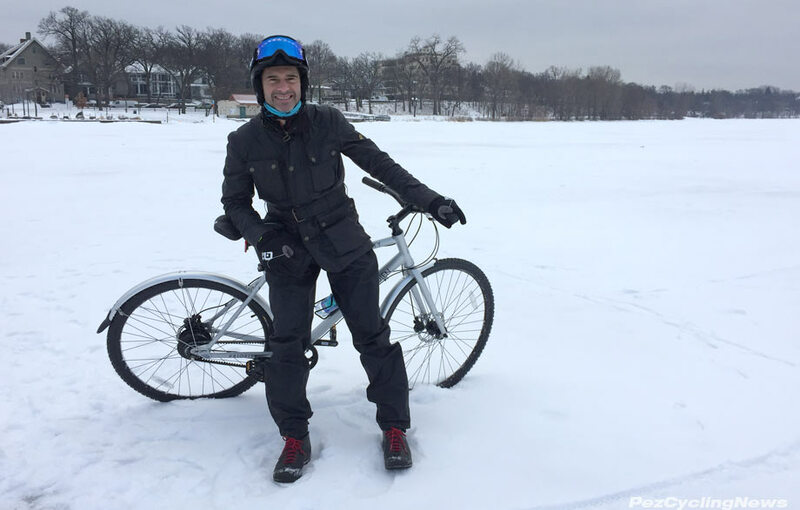 How's this for something completely different - a mid-winter trip to Minneapolis to ride stud-tired commuter bikes around the city's vast network of bike paths. 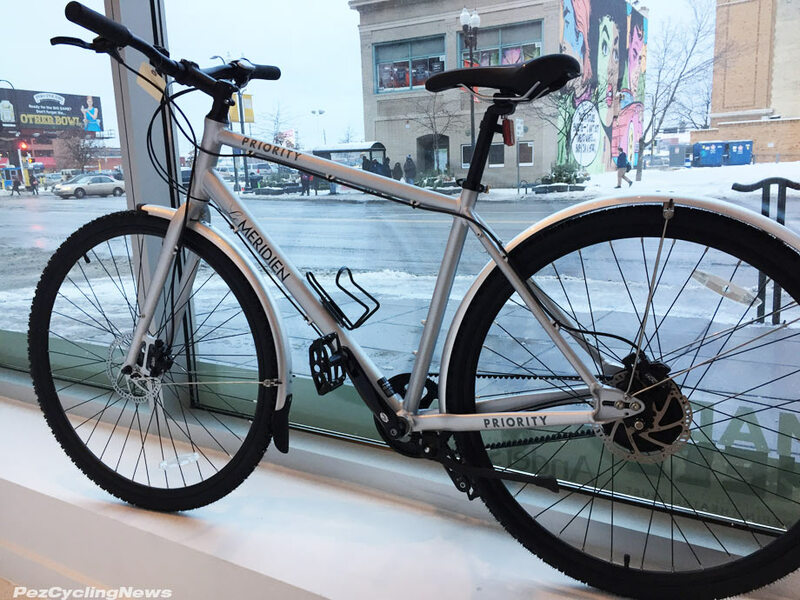 It was part of the new bikes for guests program by Le Meridien Chambers Hotel featuring Priority Bicycles. Exploring a new city by bike is always a good idea, so when this opportunity to visit Minneapolis came up, I was all in. And this not being your typical "cycling presser", I was also keen to see how the travel industry shows off its own. 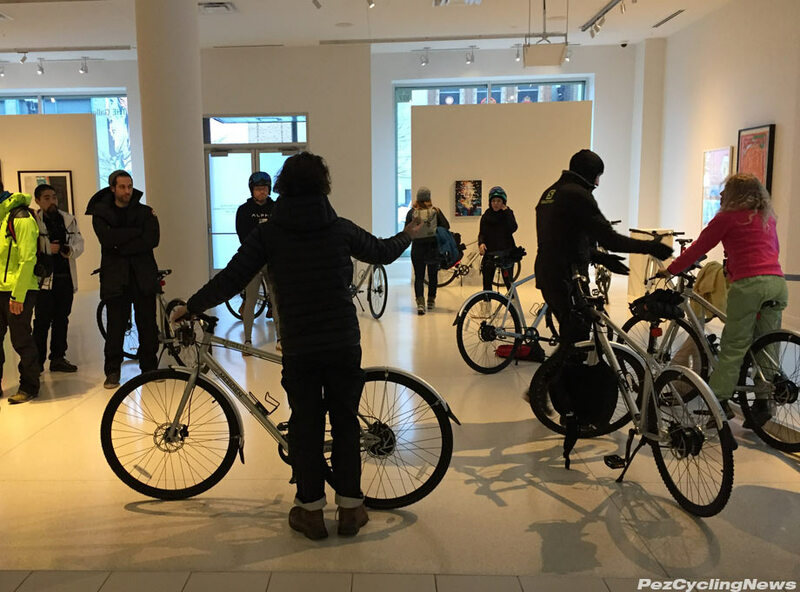 I joined a select group of writers and social media influencers invited to help launch the partnership of a new bikes for guests program between Le Meridien Chambers Hotel in Minneapolis and Priority Bikes. 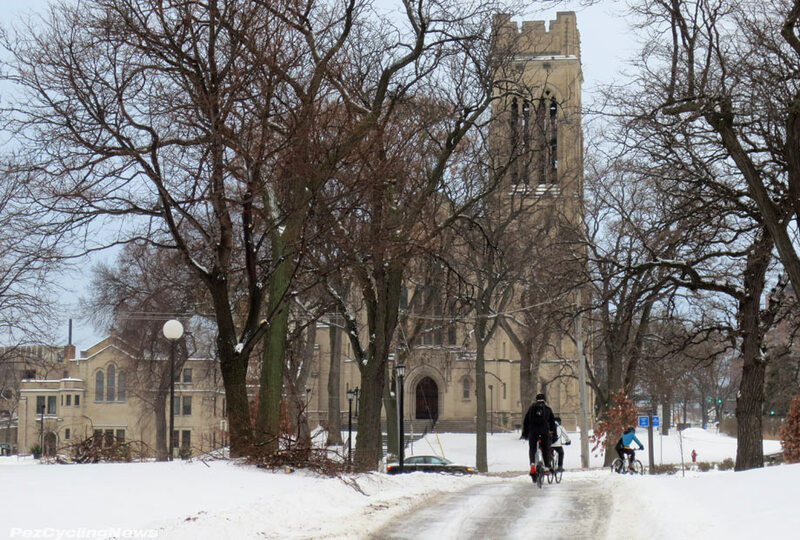 While the group was a real mix of travel focused writers, I was the only cycling-specific media source invited, but given the cycling and travel connection, I felt right at home and jumped at the chance to check this out, even in the dead of winter. Hotel general manager David Cronin is an avid cyclist, and saw this as a natural way to take advantage of the very extensive network of bike paths throughout the city (it's so vast, the city council produced this map of the bike paths) and to offer guests a unique and fun way to explore. If there's one thing I can say about the Midwest, is that people are friendly - which seems a very good way to get through the very cold winters in this part of the country. 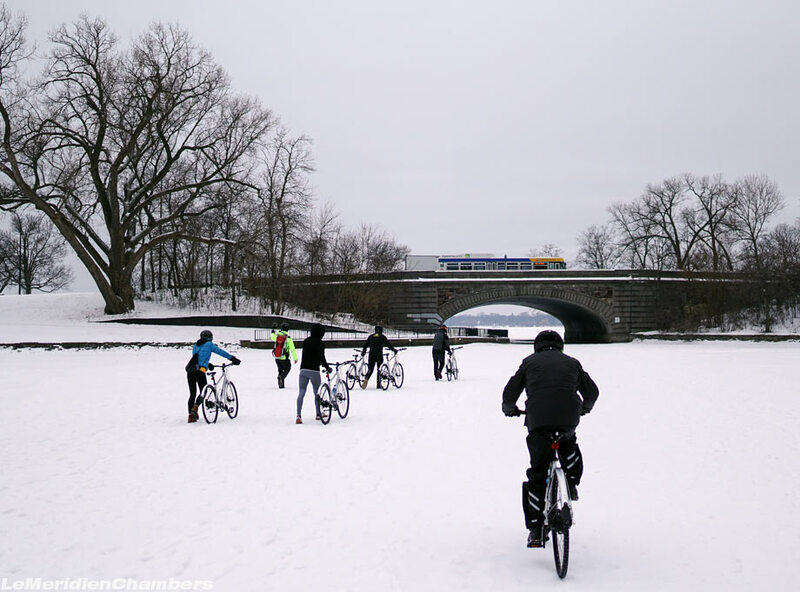 In case you didn't know, Minneapolis is a pan flat city that hosts miles and miles of bike paths that make getting around a real pleasure - whether it's commuting or recreational. For guys like me who ride to get fitter and faster, using the bike for more basic transportation is a rare & relaxing treat, one that reminded me of why I love cycling in the first place. The property has about 60 rooms - none of which have more than one bed - making it ideal for business travellers or anyone looking for a quiet and luxurious place to stay. 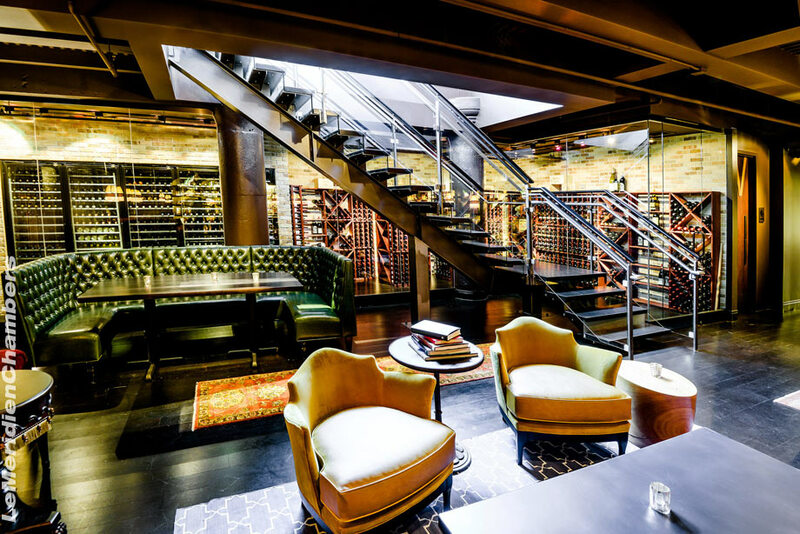 The main floor hosts the stylish Marin Restaurant - known for it's farm to table comfort-style cuisine (I had the sea bass which was excellent), and below ground is the kitchen, a very large glass walled wine vault, and a stylish but cozy bar called the Library. I was told gin is their thing here - which played well with my plans to open cocktail hour with a negroni. 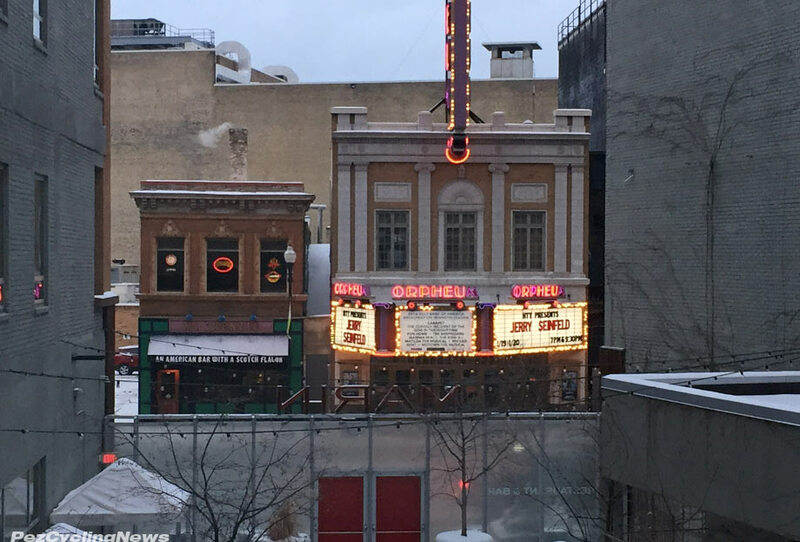 It's located on the historic Hennepin Street - directly across from the even more historic Orpheum Theatre, and a dive bar called McKenzies where I closed out the night playing 80's rock on the jukebox. And yes, there was a lot of drinking involved - which to me is a great way to get to know a city and make friends, and if you love old style American bars - then this is a town for you. 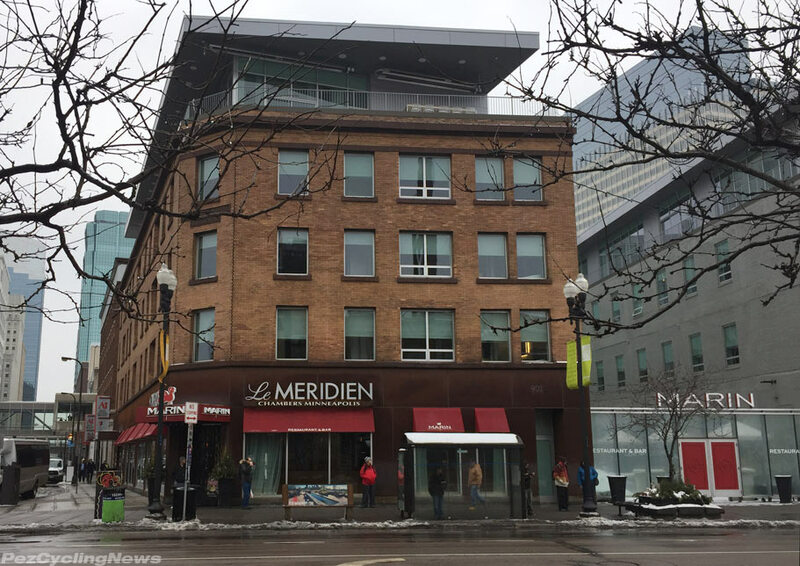 Minneapolis is also known for its thriving art community, and Le Meridien Chambers has been ranked as one of the 10 best art hotels in the US, with original contemporary art pieces hanging throughout the hotel. The main floor also hosts the large gallery space which doubled as our photo studio prior to the ride. Priority Bikes founder David Weiner gives us some last minute prep before the ride. As my first time to the Mini Apple (aka Flour City), I'd no idea what to expect, other than it was where popstar Prince lived and worked. The city seems to have recovered from the recent loss of Prince (perhaps their most famous resident), but locals told me the place was covered in purple as the town mourned his passing. But this being the Midwest, people are used to getting on with it, since the cold winters suggest that only the heartiest and happiest people would choose to call it home. The bikes were provided by Priority Bikes. A young company started in 2015 by ex-software guys David Weiner and Connor Swegle - their mix of New York energy and West Coast chill strike a perfect balance to their sensible idea to provide inexpensive, low maintenance bikes for people who want to get around quickly and in comfort, without the worry of riding your carbon racer to the corner store or office. 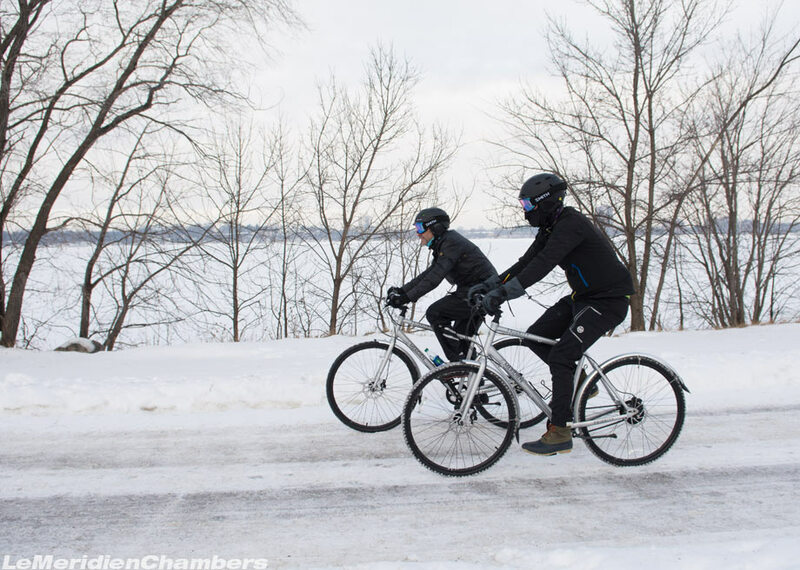 They also provide bikes to several hotels around North America, so guests can enjoy a exploring the local environs at any pace they like. 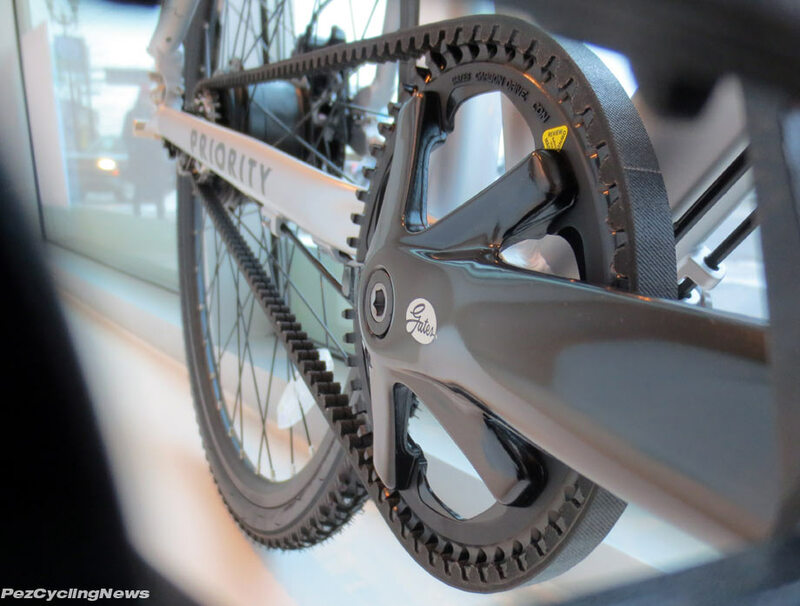 We rode their lightweight aluminum framed Continuum bikes which are built to their own specs, and feature disk brakes and a very cool Gates carbon drive train. 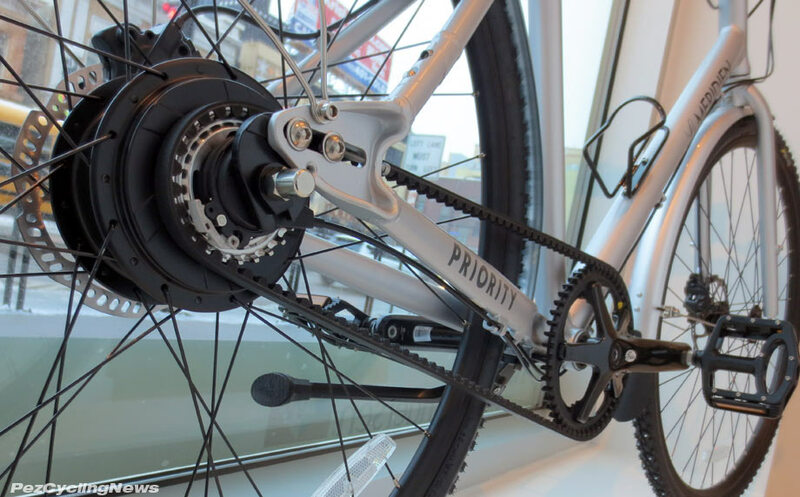 The low maintenance system uses a super quiet belt drive that doesn't need need grease (so you stay clean) and is rated for 10,000 miles of riding, which is a long time by my standards and even longer for most commuters. Gears are handled with a Nuvation internal hub that offers a decent range for most of the riding routes you'd expect in a city. Their sales model aims to cut unnecessary costs from the mix, so an online shopping cart and a well-stocked video how-to library get you a bike in a box that even comes with the only tool you need for assembly, so build up can be done at home, or of course by your local shop. Priced at under $900, this model is so inexpensive that buying a couple for the family makes perfect sense too. You can add accessories like an optional winter riding kit that includes powerful lights, and studded 35mm tires for winter or riding on rougher roads. And it was the perfect way to get around snowy streets and paths without too much worry. 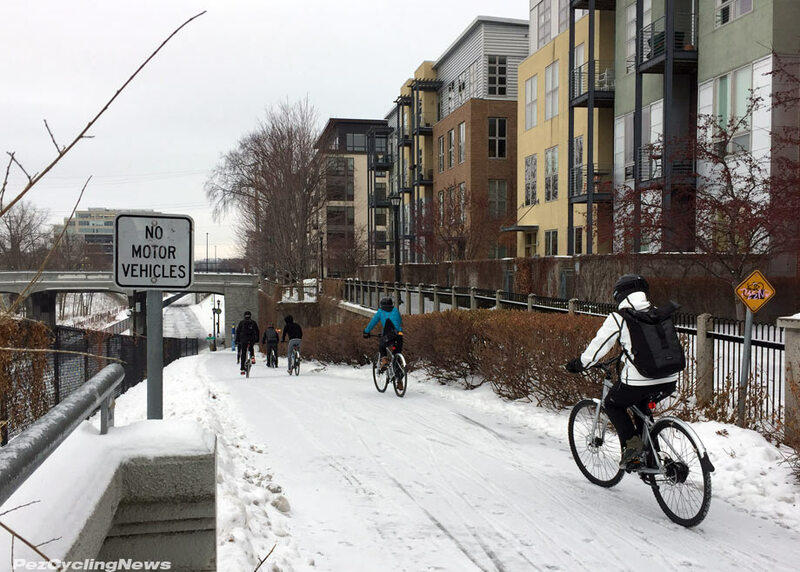 Even if an ice storm overnight meant a little more caution in the corners - the studded tires no longer seemed like overkill. And while locals called our ride day the warmest of the year at around 28F degrees, it was the coldest day I'd ridden in several years. On tap was a ride around town on the local bike paths that would lead us to Lake Calhoun - one of the 15,000 or so lakes the state is known for. Heading out directly from the hotel, it was just a few blocks until were into quiet residential streets and onto the bikes-only path network. At one point we rode through a circa-1970's brick condo development addressed as "Grant Place" which reminded me of Minneapolis' second most famous resident - the one who could "turn the world on with her smile..." - Mary Richards (the Mary Tyler Moore Show). 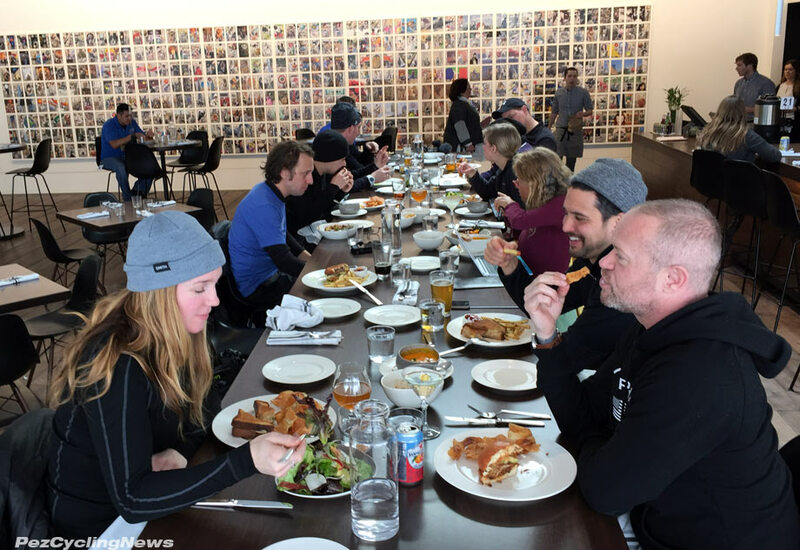 Lunch was served at the casual but gourmet Esker Grove (with another well stocked bar - this time craft beers) in the world famous Walker Art Center, where we enjoyed a post lunch tour of one of the current exhibits. While I'm not much of an artie myself, I could tell this would be like Disneyland to anyone who is. Never getting the chance (or choosing to take it) to ride in temps like this, I actually welcomed the opp to try out some cold weather gear, and our event coordinators from Diamond PR wisely advised us to bring lots of layers. For me that meant Nalini's Merino Underjersey wool long sleeve base layer, Castelli's Nanoflex Pro bib tights & new Potenza long sleeve jersey, underneath a pair of plastic pull on rain pants and waxed canvas moto jacket to block the wind. Our helmets were a Smith winter sports full coverage model which eliminated the need for a skull cap. Smith downhill ski goggles completed the look (which looked more full moto than full bike) but when it's this cold out, staying warm is the only way to enjoy the outdoors without freezing your shnurps off. Ale Bike Wear's Sottozero winter gloves finally got the workout they deserved. The wind proof outer layer performed as hoped keeping out the chilly wind, while the fleece lined interior did the business keeping my fingers amazingly warm for the full 3+ hour ride. While we'd been offered heavy winter gloves with a warm liner, I much preferred the much lighter Sottozeros, considering I was constantly pulling one off to shoot photos. Naturally our pace was a relaxed one but that was the whole point - to take our time exploring some of the essential parts of the city without the hassle of getting in a car to get there. Minneapolins also like to eat - and eat well. The downtown is filled with restaurant and bars, including Manny's Steakhouse, located in the W Hotel, itself located in the famous Foshay Tower which was built as a sign of opulence and ego in 1927. 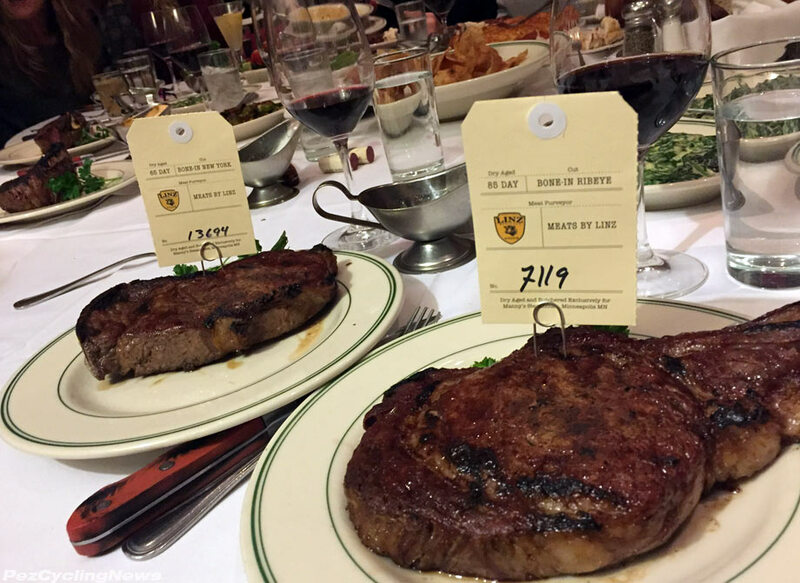 Our post-ride celebratory dinner was over-the-top decadence - and I was in steak-lovers' nirvana - and yes - that 85 day aged ribeye tasted as good as it looks. 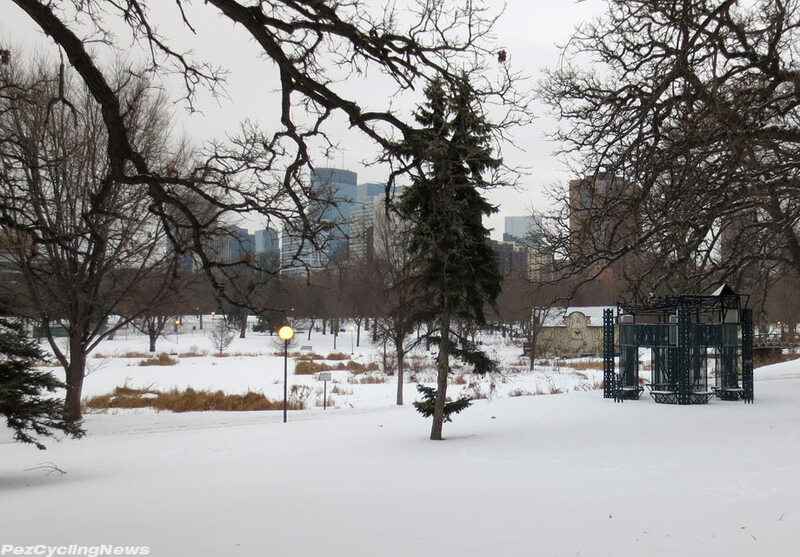 As my first time to Minneapolis, I'd no idea what to expect, but even in the dead of winter I was left wishing I'd had longer to explore the city- geez I never even made it to the Mall of America - which someone told me is the largest tourist destination in America. Guess I'll have to come back with Mrs. Pez. As a send off - I'll leave you with this video from world travelling adventure loving goofball Ryan VanDuzer (DuzerTv.com/) that perfectly captures the ride.